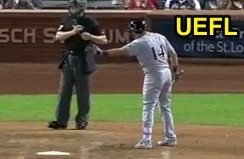 HP Umpire Carlos Torres ejected Brewers 1B Hernan Perez for arguing a strike three call in the top of the 8th inning of the Brewers-Cardinals game. With two out and the bases loaded, Perez took a 2-2 sinker from Cardinals pitcher Adam Wainwright for a called third strike. Replays indicate the pitch was located off the outer edge of home plate and thigh high (px 1.119, pz 2.451), the call was incorrect. At the time of the ejection, the Brewers were leading, 1-0. The Cardinals ultimately won the contest, 5-1. This is Carlos Torres (37)'s fourth ejection of the 2016 MLB regular season. Carlos Torres now has 4 points in UEFL Standings (6 Previous + 3 AAA - 1 Penalty - 4 QOCN = 4). Crew Chief Gerry Davis now has -3 points in Crew Division (-3 Previous + 0 Incorrect Call = -3). This is the 155th ejection report of the 2016 regular season. This is the 72nd player ejection of 2016. Prior to ejection, Perez was 1-4 (SO) in the contest. This is Milwaukee's 3rd ejection of 2016, T-3rd in the NL Central (PIT 12; CIN 6; CHC, MIL 3; STL 1). This is Hernan Perez's first career MLB ejection. This is Carlos Torres' first ejection since August 2, 2016 (Kendrys Morales; QOC = N [Balls/Strikes]). Wrap: Milwaukee Brewers vs. St. Louis Cardinals, 9/10/16 | Video available via "Read more"